Life of a 14 year old girl Nam, who falls in love with her senior of tenth grade P'Shone and tries desperately to win his attention. Lynn, a genius high school student who makes money by helping others cheat tests, receives a new task that leads her to Sydney, Australia. 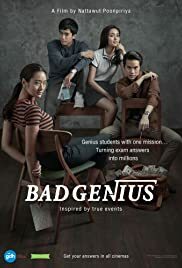 In order to complete the millions-Baht task, Lynn and her classmate have to finish the international STIC (SAT) exam and deliver the answers back to her friends in Thailand, before the exam takes place once again in her home country. Bank: Even when we study as well as each other, it doesn't mean we act in the same way. I thought the film that only tells you a story about student, school life, and cheating on exam is boring and cliché. I was wrong, because when i finished watch this movie, i can tell that every aspect of this movie is good. It has good story, good meaning of friendship, family and it offer you good humour too. The director makes this film which tell about the cheating on exam is so intense, brilliant, and stylish. Its not just focusing on main actor, but the supporting actor too. They can make the connection between character and the character building is perfect too. This movie gives you everything !